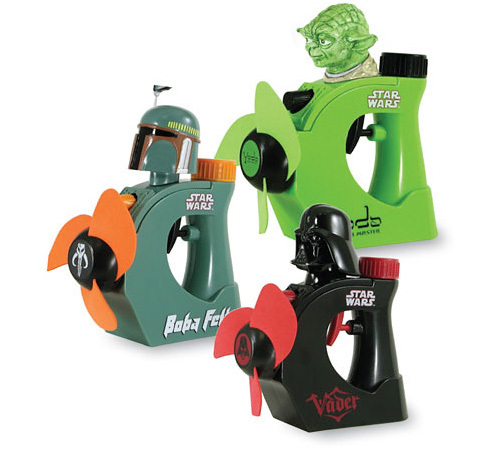 Star Wars Misters… Why?! Why?! Why?! | OhGizmo! Star Wars Misters… Why?! Why?! Why?! Oh wait… that’s why.. I keep forgetting about the whole profit thing. By now you’d think I’d have gotten to used to the great lengths that Lucasfilm will go to license the Star Wars brand, but I’m afraid these misters have left me shaking my head. They come in your choice of a Darth Vader, Yoda or Boba Fett theme, and feature color schemes that match the individual characters. (Though Yoda’s lime green tint looks way off to me.) They each require 2 x AA batteries to power the fan, and are available from the Wireless Catalog for $18.95 a piece. Though how they’re all sold out is beyond me. No surprise here. Lucas will whore out Star Wars to anything these days. I have to admit.. the Fett one does look kinda cool.